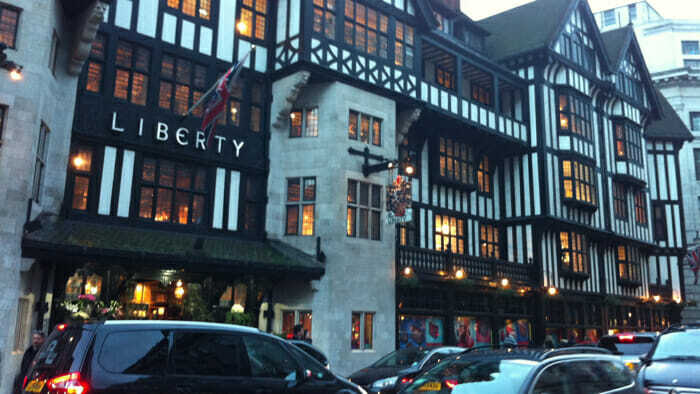 LIberty of London dates back to 1875. It’s located just south of Oxford Street and in the first block east of Regent Street. Around the corner is Carnaby Street. Yes, this is the heart of London shopping. There are many fabulous shopping areas in London. There are markets like Covent Gardens where you’ll find unique gifts and handmade jewellery and High Streets like Marylebone where you’ll find local shops among High Street names. But if you want to hit the highlight of London shopping, head to the corners of Oxford and Regent streets. 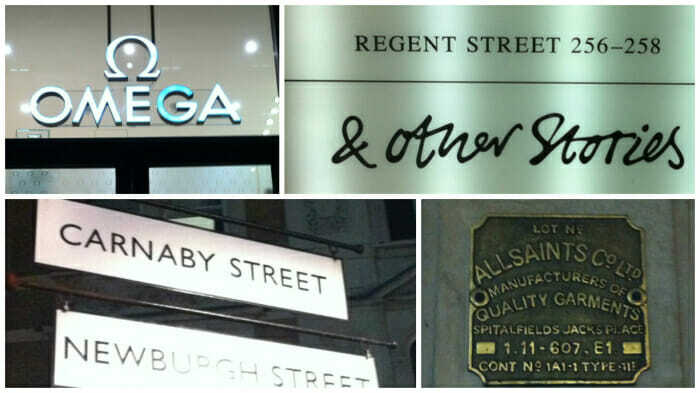 From there you’ll easily find some of the oldest stores in London as well as the newest. If shopping is your London priority you may prefer to save on accommodation in this expensive city so that you can spend more on things. If so, I have a suggestion. YHA London Oxford Street is where I stayed this past November thanks to Hostelworld.com. Just one block from Oxford Street and three from Regent Street, it is perfectly located for shopping on both and Carnaby Street as well. For more on London read Affordable London: 32+ Free and Low-Cost Tips. Oxford Street shopping at night. From the famous prints at Liberty’s which are back in style, to Selfridge’s, the department store that is currently the subject of a British television show, Mr. Selfridge, to H&M where sometimes people line up through the night hoping to be among the first to see a new line by a designer such as Alexander Wang, this area has it all when it comes to large stores and major brands. 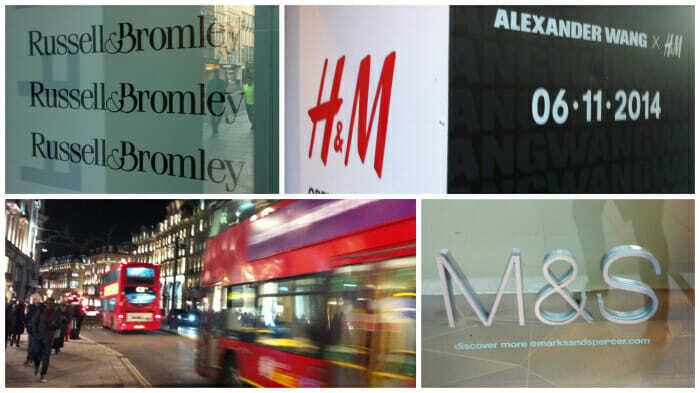 There are over 300 shops on Oxford Street. (You can download a map of Oxford Street here that graphically shows the locations of the major brands.) Regent Street has somewhat fewer shops but they tend to be more upscale. There’s also Carnaby Street, famous for defining British fashion in the Swinging 60s though I found that you have to go down the side streets from Carnaby to find the more interesting shops. A suggestion: if you’re in the mood to explore rather than really shop, start at Oxford Circus where you can pop into Selfridges. Then head south on Regent Street as far as Beak Street. Turn left and return via Carnaby Street where you’ll end at Liberty of London – or, on your right just two blocks, YHA London Oxford Street. Or, if you’re looking for more London Attractions, consider the London Pass as it will save you money and in many cases let you skip the line. Just a few of the many stores at the corner of Oxford and Regent streets. 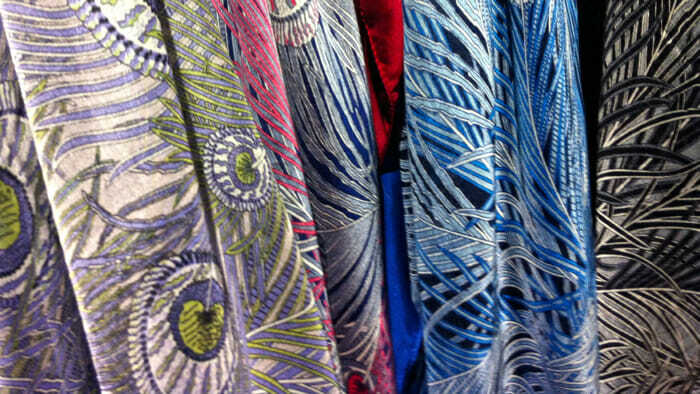 Just a sampling of Liberty prints. At one point the store’s goal was to offer modern design and “combine utility and good taste with modest cost.” Now the designs are vintage and the costs, well, not quite modest. Beautiful products! From the street, this hostel is barely noticeable – it has a nondescript entrance. Press the buzzer to be let in and take the elevator to the third floor where you’ll find reception and a friendly staff. (Leaving, I always took the stairs so that the elevator would be available for those going up.) Given that the hostel is in London, the people staying (and chatting) in the common room were from all over the world – I found myself translating for French travelers on two different occasions. My room, as you can see below is basic and has a bunk bed so that it can be offered to two people but I took it as a single. The shower and toilet were about three steps down the hall. FYI, wearing pyjamas into the hall in the morning is standard at hostels. It was a perfectly pleasant place to stay for the week I was in London. 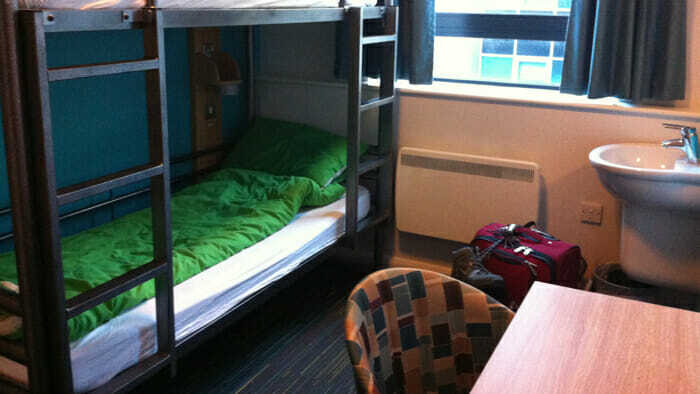 My private room at YHA London Oxford Street was 70 GBP per night. Less than almost any hotel room and far, far cleaner. I find YHA hotels to be impeccably clean. 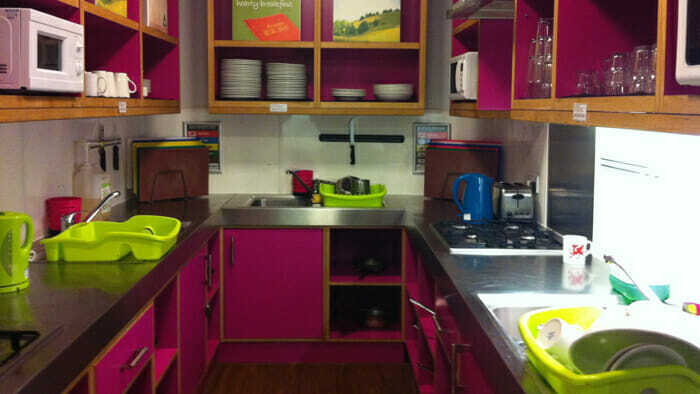 The kitchen at YHA London Oxford Street. I ate breakfast and dinner there most days. The food department on the lower level of Marks & Spencers (just one block away) has an amazing variety of freshly prepared, nutritionally-balanced dinners that just needed a couple of minutes in the microwave. Again, this would leave more money for shopping. My thanks to Hostelworld.com for arranging for my London accommodation this year. All opinions expressed in this post are my own. Get your London Pass to attractions. Purchase a BritRail London Plus Pass for day trips for destinations like Bath, Cambridge, Stratford-Upon-Avon and more or a rail pass for the UK.